Home prices continued to climb across the Bay Area in May, led by San Francisco where the median sales price for single-family homes reached $1,087,500 — up a phenomenal 45 percent in just four months and only the second time in more than five years that the median price topped $1 million. Homes remained in exceptionally short supply in Pacific Union’s East Bay region, prompting aggressive bidding among buyers and giving sellers the highest sales price premiums of anyone in the Bay Area: Final sales prices averaged nearly 14 percent above asking prices. May’s median sales price was up 38 percent from a year ago in Napa County, and up 29 percent in Sonoma County. Click on the images accompanying each of our regions below for an expanded look at real estate activity in May. The median sales price of Contra Costa County homes reached $825,000 in May after climbing steadily from $582,000 four months earlier. Sales priced topped sellers’ asking prices by 2.3 percent, evidence of the multiple offers that have become routine in the Bay Area over the past year. Homes sat on the market an average of just 18 days in May, half the time it took to close a deal a year earlier. The only real estate market with a faster turnaround was in Pacific Union’s neighboring East Bay region. Contra Costa County had a 1.1-month supply of homes on the market in May, only slightly above the record low of 0.9 months’ supply in December. The East Bay region remained the tightest real estate market in the Bay Area in May, with homebuyers and sellers reaching deals after an average of 17 days on the market. It’s a telling sign of current conditions that the East Bay was also considered to be an exceptionally tight market a year earlier, when the average stood at 31 days. Quick sales also explain why the supply of available homes held steady in May at just a 1.1-month supply. Similarly, the median sales price rose for the fourth consecutive month to $790,000, up from $588,500 a year earlier. With eager buyers and exceptionally tight inventory, East Bay sellers have enjoyed the highest premiums above asking prices all year. In May the gap widened even further, with sales prices 13.8 percent above original asking prices. The median sales price for Marin County homes held steady at $950,000 in May, up 23 percent over the previous year. Sales prices averaged 0.5 percent above asking prices, the highest level in more than a year. The supply of available homes stood at 1.4 months in May, down from 1.7 months in April and 2.5 months a year ago. The average days on the market dropped to 47, down from 102 days in January and 72 days in May 2012. Home prices have been rising steadily all year in Napa County, and by May the median sales price reached $480,000, a 38 percent jump over the past 12 months. Sales prices averaged 96.7 percent of original prices, up from 91.3 percent a year earlier. The inventory of homes on the market edged higher to a 2.4 months’ supply but remained far below the 4 months’ supply in September 2012. Sales agreements were reached after an average of 85 days on the market — the slowest sales pace of any region in the Bay Area. San Francisco home prices continued to rise by leaps and bounds in May. In April the median sales price for a single-family home reached $1 million for the first time in more than five years. The median price climbed again in May to $1,087,500 — up a remarkable 45 percent in just four months. Multiple bids pushed sales prices 7.5 percent above sellers’ asking prices, down slightly from the 7.7 percent premium paid in April. Homes sold after an average of just 32 days on the market, the quickest sales in more than a year. The inventory of available homes fell to 1.2 months’ supply, the lowest supply this year. Unlike single-family homes, the market for San Francisco condominiums cooled ever so slightly in May, with the median sales price slipping to $870,000 from April’s peak of $900,500. Sales prices were 4.3 percent above asking prices, down from 4.9 percent in April. Sales prices failed to exceed asking prices in only two of the previous 12 months, and even then by less than 1 percent. The inventory of homes on the market slipped for the fourth straight month to 0.8 months’ supply, less than half the supply in May 2012. The average days on the market fell to 38, down from 53 days a year ago. The median sales price for homes in Pacific Union’s Sonoma Valley region slipped to $532,500 in May from $605,000 in April, but it remained far above the $392,500 median of a year earlier. Sales prices averaged 98.2 percent of original asking prices, the highest level in more than a year. The average days on the market fell to 60, down from a high of 144 in May 2012. The months’ supply of inventory came in at 1.9 in May, down solidly from 2.9 months in April and 3.6 months a year ago. Prices for single-family homes in the Tahoe/Truckee region pulled back in May with a median sales price of $479,000, down from $519,000 in April. Still, May’s median price remains one of the highest in the past 12 months and solidly above the $449,000 median recorded a year ago. Sales prices averaged 95.5 percent of original prices, the highest level in more than a year. The region had a 5.8 months’ supply of homes in May after reaching a low of 3 months’ supply in March. The average days on the market has been dropping for three months and fell to 74 in May — significantly lower than levels maintained for the past year. 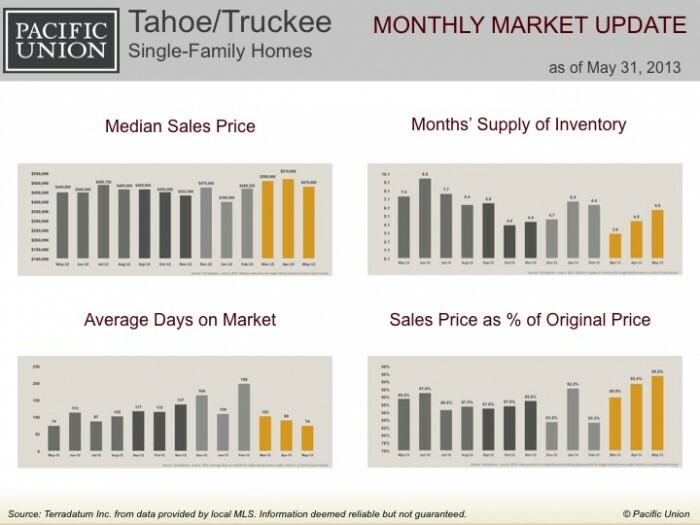 The median sales price for condominiums in our Tahoe/Truckee region rose slightly to $321,500 in May after fluctuating for much of the past year. The median price reached a high of $380,000 in March, climbing from a low of $228,000 in June 2012. Other metrics showed similar swings. Sales prices averaged 91.8 percent of asking prices in May, down from 95.5 percent in April but above July’s 84.7 percent. The real estate market had a 6.5 months’ supply of condos in May, down from 19 months in April. Homes remained on the market for an average 175 days in May, up from 164 days in April and 89 days in September but down from 251 days in July.